It's scorching hot here in the Auvergne and we've not been all that hungry. Our traveling larder offered up tagliatelle and a tin of sardines with which we used up fresh garlic, red chili and an onion, plus some living thyme and a small pot of hummus. Eaten in the shade of a tree with crusty bread on the side, and costing next to nothing, it was better than anything you might have paid through the nose for in a restaurant. 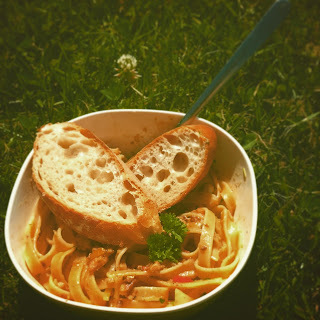 Meals like this are great for camping because pasta and sardines are so easy to carry around. We have a small plastic box with basic ingredients like this, plus things like olive oil, balsamic vinegar, tomato puree and ten herbs and spices. If we don't get to a supermarket, and this being France, even if you do it's probably closed, then we still have enough to cook a meal. If we are able to shop then it's just for meat and maybe fresh veg, knowing we had the rest of the ingredients to make a tasty meal. The Friday-night dash for Folkestone, the first chapter of all our European adventures, isn't ever going to be a holiday highlight. There's usually a traffic hold up on our journey to the Eurotunnel terminal. Once safely across the channel, French motorways are a dream to drive on. 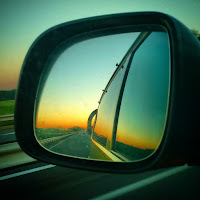 We put our watches forward an hour and the sun was going down as we continued our drive south. Saint Imoges is a perfect overnight stopping point being just ten minutes off the motorway, with a generously-sized aire de camping car in woodland, next to a lake and just outside the village. It was still 21°C when we stepped out of the van into the pitch-black night. There was a light breeze but it was warm, like a summer-holiday evening. It was midnight and the only sounds were ours, as we popped up the roof and put our pillows and duvet on the upstairs bed, and the faint hoot of an owl in the distance. Sometimes fitting around each other's busy diaries means a camping meet up must be done on a weeknight. Cleopatra enjoyed being pitched side by side with Daisy for the first time in ages while four friends ate, drank, and laughed the night away. The weather wasn't promising for this weekend and so we decided to camp near to a city so we'd have shopping and pubs on our doorstep if it rained too much. Norwich is great for a camping city break with campsites on the Norfolk Broads still only a thirty minute walk from the city centre. We left it too late to get into Whittlingham Broad campsite and so this was our first visit to the Camping and Caravanning Club site which turned out to be a pleasant surprise, comprising three largely-unspoiled fields. Trying not to fall back in to the habit of returning to campsites we’ve been to before every weekend we tried a Camping and Caravanning Club Certified Location this weekend. The site was Dan’s Meadow near Woodbridge in Suffolk. It is a lovely little site with five serviced pitches (electricity, TV points and Wi-fi), and fantastic toilets and showers - better than almost any we’ve seen on a campsite, let alone on a CS or CL. A pub is within five minutes walk, but it was the walk along the river Deben to Woodbridge that really made the weekend for us. High Sands Creek campsite in Stiffkey is one of our much-loved, regular weekend getaways. We enjoy it for the site's simplicity - no electric, no caravans or large motorhomes, just tents and campervans which give it a far more genuine camping vibe. One of the benefits of its location is the coastal path to the stunning Wells-next-the-sea, walkable in an hour. I've written about it before and so this weekend I decided to capture it on video. Fish finger sandwiches are amazing and require so little effort they're the perfect first-night-camping meal. We general travel after work on a Friday and so like something super quick and easy to prepare for dinner. Last week in the New Forest we had fish finger sandwiches which prompted me to consider if there was a way to pimp them up a little. 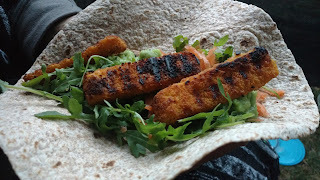 Enter the fish finger and mushy pea wrap! It can still be prepared in one pan, just put the fish fingers to one side once cooked while you heat the mushy peas for a couple of minutes. Assemble in a tortilla wrap along with some lemon zest, salad leaves, grated carrot and some sliced pickled gherkins or cornichon. 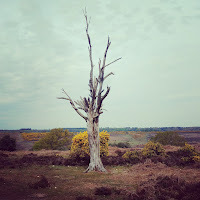 The New Forest is quite a drive for us and so we saved our second visit to Tom's Field until a bank holiday weekend. We spent two full days hiking, on Saturday to Fordingbridge as mentioned in my previous blog post, and to Fritham on Sunday. Rain was forecast for Sunday and so we put on waterproof over-trousers and coats and set off on what's signposted Ashley Walk just across the road from the campsite. It's stunning and so peaceful, letting you cross far enough into the heathland that you can no longer hear traffic, just the wind in the trees. Wild horses and donkeys roam free, alongside cows and they all tend to give you a wide berth as you pass. We followed the track towards the village of Fritham, the weather holding until we reached the Royal Oak pub. It was Sunday lunchtime and the pub was busy, but we found a table outside under the large marquee. Tom's Field is an occasional campsite in the New Forest where you can really go back to basics and enjoy a unique part of the English countryside.